Around 36 million years ago, an asteroid smashed into what is now the Canadian province of Newfoundland and Labrador. New research suggests that, for a brief time, the temperature at the point of impact exceeded 4,300 degrees F (2,370 C), making it the hottest temperature known to have occurred on Earth. 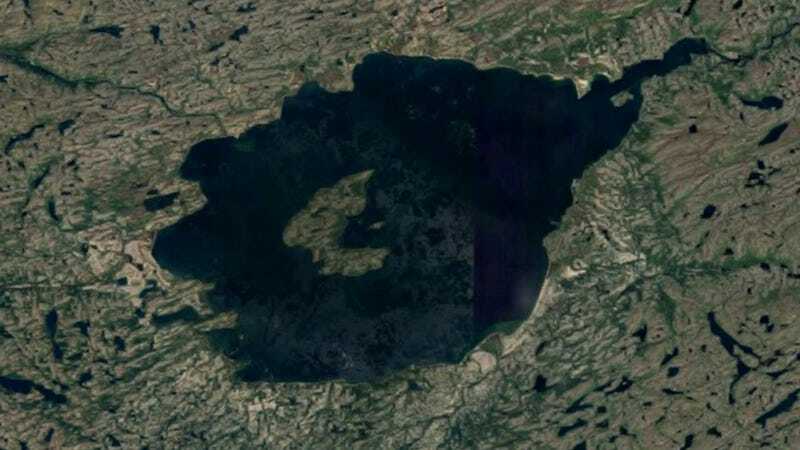 Today, the point of impact is an oddly circular lake with a central island, and there’s plenty of evidence to show that Mistastin crater, as it’s known, was caused by an asteroid. The immediate area in-and-around the lake contains glass-like minerals, melt rocks, shatter cones, and signs of a shock wave. Very importantly, the crater walls also contain cubic zirconia—a gemstone that can only form when temperatures exceed 2,370 degrees C.
Indeed, minerals tend to vaporize when exposed to these sorts of temperatures, so the presence of cubic zirconia offers an important clue as to what happened on that fateful day some 36 million years ago. Today, Mistastin Lake still looks like a crater from space, even though it’s filled in with water. After the asteroid hit, the site was home to a massive crater that stretched for 17 miles (28 km). The cataclysmic event happened during the Eocene epoch after the dinosaurs had gone extinct and mammals began to emerge. The impact likely produced global effects that lasted for decades. Importantly, the finding also speaks to the conditions on Earth during the Late Bombardment Period, when asteroids struck the planet with great regularity. “Moderate sized impacts, comparable to Mistastin, are predicted to have completely resurfaced the Earth within the first tens of millions of years after the Moon-forming event,” write the authors in the new study. These steady impacts played an important role in forming the composition of the crust, while introducing and mixing elements in the atmosphere. Ironically, these violent events would eventually contribute to the establishment of habitable conditions on Earth.